(LINCOLN, NE) The 25th annual DISC GOLF ICE BOWL will be held on Sunday, January 25 at the Tierra Park Disc Golf Course in Lincoln, NE (S 27th and Tierra Dr). Registration opens at 1:00 p.m. and closes at 1:30 at the picnic shelter. The entry fee is $10 which is a donation to the Food Bank of Lincoln. All players are welcome regardless of ability. Everyone will have a chance to win a prize. There will also be closest-to-the-pin contests for prizes with the proceeds going to the charities. Items that can be used as prizes are also welcome. 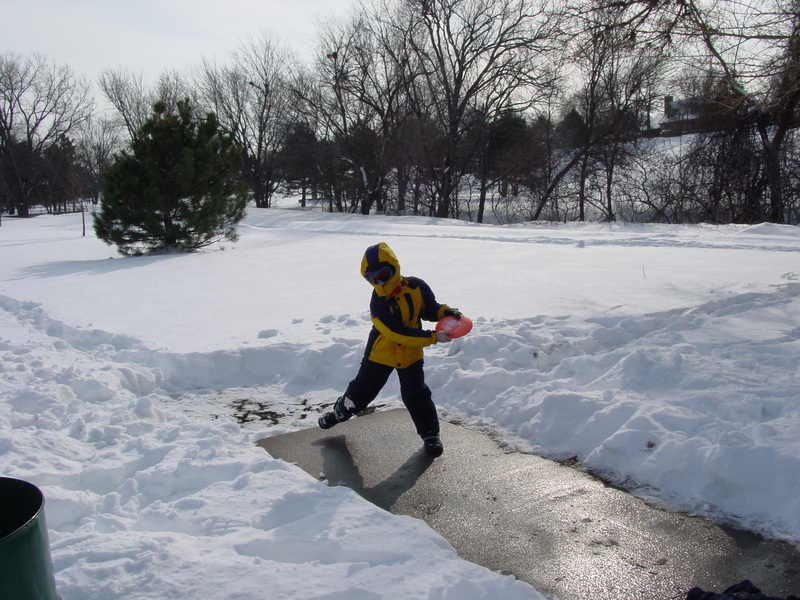 The first Disc Golf Ice Bowl was held in Columbia, Missouri in 1987. It was subsequently promoted as a day of disc golf solidarity in the gloom of winter by the Lincoln Flying Disc Club. Official Ice Bowls are played at courses all over the United States, and in Canada and Europe in a corridor that runs this year from January 3-March 1. Each event finds a charity to support. The Ice Bowl charitable fundraising goal for 2015 is $325,000 worldwide. In 2014, over $300,000 was raised at 230 Ice Bowls. Last year’s leading fundraiser was the Mile High Ice Bowl in Denver, Colorado that raised a cool $20K for the Food Bank of the Rockies. The coldest Ice Bowl was -19°F in Saskatoon, Saskatchewan. The snowiest events where the players walked through or on 36 inches of snow was in Kalkaska, Michigan and Huntsville, Ontario. Last year in Lincoln, the temperature was a non-too-icy 53° with no snow, which helped to get over 40 players involved. The 2015 LFDC Ice Bowl raised a $555 for the Food Bank of Lincoln. According to last year’s Ice Bowl director, Andrew Chisholm, “Ice Bowl is a popular tournament we have here in Lincoln. The weather last year was pretty temperate, and we had lots of people including members of the Lincoln Ultimate Disc Association and the Lincoln Flying Disc Club. Most of them played some golf, but some just came out to say hi and to help the cause. For those who’ve been thinking about checking out disc golf, the Ice Bowl is a good place to start because the emphasis is on fun and charity rather than pure competition.” Since 1990, the LFDC has raised over $7,000 for local charities. Disc golf is similar to golf (disc golfers often call it “ball” or “stick” or “traditional” golf) in procedure, pace, and psychology. Instead of clubs and balls, disc golfers used golf discs (smaller, heavier, and aerodynamically superior to the Frisbees used for playing catch). Instead of a cup, disc golfers “hole out” in a disc golf basket or target. Usually made of steel, it features a basket that is attached to a pole about two feet above the ground and has chain assemblies above the basket which act as a backboard that stops the disc’s forward motion, causing it to drop into the basket. Disc golfers play the throw from where it lies, and count each throw until the disc lands in the basket or within the chains. Disc golf is a lot of fun, quite challenging and relatively inexpensive to play. The non-profit Lincoln Flying Disc Club and Lincoln Ultimate Disc Association organizes recreational play all year long, including winter weekends. For more information, visit http://www.nebdisc.com or http://www.lincolnultimate.com. Congratulations to the top rated Nebraska disc golfers in January, 2015.